Sen. Tom Cotton’s letter to Iran is plainly stupid: The Arkansas freshman and his Senate Republican colleagues have embarrassed themselves badly. The letter 47 Republican senators sent to Iran is one of the most plainly stupid things a group of senators has ever done. 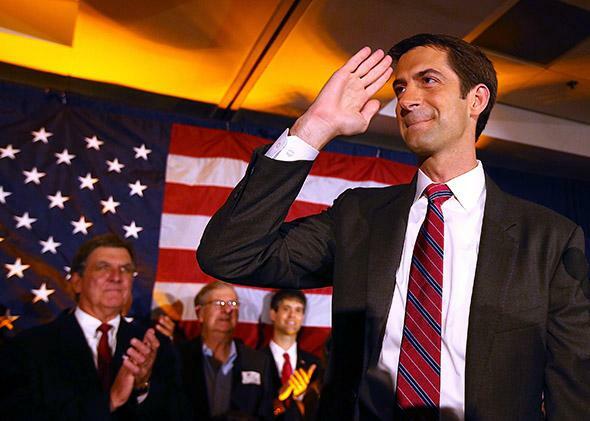 Rep. Tom Cotton, now a senator, salutes supporters during an election night gathering on Nov. 4, 2014, in Little Rock, Arkansas. It is a useful thing when a political party reveals itself as utterly unsuited for national leadership. This may be the one redeeming feature of Monday’s letter to the Iranian government signed by 47 (or, to put it another way, all but seven) Senate Republicans. The letter—which encourages Iran’s leaders to dismiss the ongoing nuclear talks with the United States and five other nations—is as brazen, gratuitous, and plainly stupid an act as any committed by the Senate in recent times, and that says a lot. It may also be illegal. The banalities begin with the greeting: “An Open Letter to the Leaders of the Islamic Republic of Iran.” By custom, a serious letter to foreign leaders would address them by name. Who is it that the senators are seeking to influence: the supreme leader, the Parliament, the Revolutionary Guards? Clearly none of the above, otherwise it wouldn’t be an open letter. Nor, if this were a serious attempt of some sort, would Majority Leader Mitch McConnell (who was among the missive’s signatories) leave the task of organizing it to the likes of Arkansas Sen. Tom Cotton, an otherwise unknown freshman. As usual, the Republicans’ goal is simple: to embarrass and undermine President Barack Obama. Reading this, one can only wonder if these Republicans ever consult their staffs. As the Iranian leaders know, and as the Obama administration and the other P5+1 governments have made clear all along, the deal being negotiated is not a treaty, nor is it an agreement. Rather, it is a nonbinding international arrangement, to be signed (if it is signed) by the United States, the United Kingdom, France, China, Russia, Germany, and Iran. Similar agreements have been struck on a host of arms control measures over the years, including President George W. Bush’s Proliferation Security Initiative, President Gerald Ford’s Helsinki Final Act, and several hundred bilateral and multilateral measures, guidelines, and memoranda of understanding struck over the decades. In other words, contrary to the letter writers, Congress has no legal or constitutional role in the drafting, approval, or modification of this deal. It does, potentially, have one practical role: If the deal calls for the lifting of all sanctions against Iran, in exchange for a cutback in Iran’s nuclear program, Congress could vote down a bill to end the sanctions that it had once voted to impose. This is a small share of the sanctions, compared with those that the president and the European Union could release on their own, but if the deal calls for an end to all sanctions, Congress could throw a wrench into the works. However, this only states the obvious. Congress can insert itself into all executive prerogatives through control of the purse strings. This is very different from the powers that the letter writers pretend to have over the future of this accord. The letter writers are also wrong in saying that a future president could “revoke” this deal “with the stroke of a pen.” In fact, there’s nothing to revoke. To nullify the accord, the president would have to reimpose the sanctions that this deal would have lifted (assuming that’s part of the deal). Future presidents could do this if they wanted. Presidents can do lots of things if they want. They could also declare a national emergency and suspend habeas corpus if they wanted. Such arbitrary acts would create their own crises; again, the warning has nothing to do with this accord. The 47 Senate Republicans also expose a tin ear to the political resonances that their letter is likely to set off. As much as their constituents may dislike President Obama, I suspect that they dislike Iran’s mullahs more deeply. Do the senators think they’ll score points by cozying up to Ayatollah Khamenei? It’s all too clear what they’re trying to accomplish, but it’s puzzling that their techniques are so ham-fisted. The explicitly partisan nature of the letter—all 47 signatories are Republicans—is sure to alienate the considerable number of Democrats who oppose, or at least look skeptically toward, any dealings with Iran. And of course, the letter comes in the wake of—and may have been inspired by—Israeli Prime Minister Benjamin Netanyahu’s provocative speech to Congress, which had the same effect of pushing those Democrats, who were there for the co-opting, to cling more tightly to their president. It’s also puzzling that the letter was signed by Sens. John McCain and Lindsey Graham, who are quick to defend the president’s constitutional right to wage war—yet, in this instance, try to constrain his right, declared in the same Constitution, to wage diplomacy. Unless the 47 Senate Republicans view the prospects of an Obama diplomatic triumph as an injury, for which they seek redress from the Iranian mullahs, I suggest that they bone up on the American legal system before lecturing others on its meaning.